"The alignment extends from Apoyeque to Managua (figure 1) and lies on the W boundary fault of the Managua graben. Phreatomagmatic and Strombolian activity occurred during the past 30,000 years, with about 40 separate eruptions, the most recent <2,500 years ago. A study well drilled to 300 m in the San Carlos crater did not detect thermal activity. There were reports of gas emission after earth tremors in the early 20th century (El Heraldo, 24 October 1916) and some aftershocks of the 1972 Managua earthquake were located on the alignment." Figure 1. Sketch map of the Nejapa-Miraflores alignment, after Bice (1980). Reference. Bice, D.C., 1980, Tephra stratigraphy and physical aspects of recent volcanism near Managua, Nicaragua: Ph.D. Dissertation, University of California, Berkeley, 422 p.
The Global Volcanism Program has no Weekly Reports available for Nejapa-Miraflores. The N-S-trending Nejapa-Miraflores alignment, located near the western margin of the Nicaraguan graben, cuts through the western part of Nicaragua's capital city, Managua. This alignment, which has erupted tholeiitic basaltic rocks similar to those from mid-ocean ridges, marks the right-lateral offset of the Nicaraguan volcanic chain. 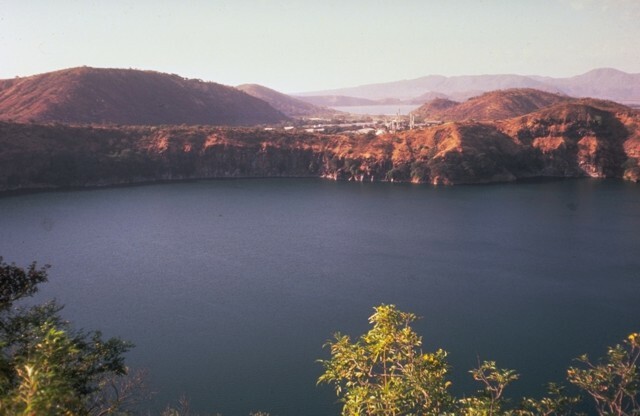 A series of pit craters and fissure vents extends into Lake Managua and is continuous with the volcanic vents on the Chiltepe peninsula. An area of maars and tuff cones perpendicular to the N-S trend of the lineament forms the scalloped shoreline of Lake Managua. 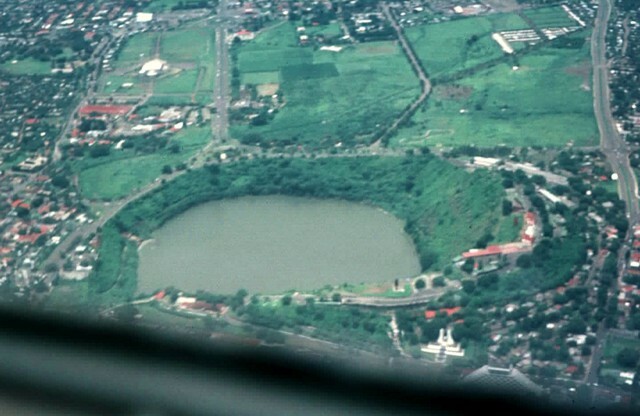 Laguna Tiscapa crater is located several kilometers to the east near the central part of the city of Managua. The elongated Nejapa and Ticoma pit craters are surrounded by small basaltic cinder cones and tuff cones. The Nejapa-Miraflores alignment (also known as Nejapa-Ticoma) has been the site of about 40 eruptions during the past 30,000 years, the most recent of which (from Asososca maar) occurred about 1250 years ago. Hradecky P, 1997. Estudio geologico para reconocimiento de riesgo natural y vulnerabilidad geologica en el area de Managua. Cesky Geologicky Ustav Praha, Instituto Nicaraguense de Estudios Territoriales, Managua (INETER), 81 p.
McBirney A R, 1955. The origin of the Nejapa pits near Managua, Nicaragua. Bull Volcanol, 17: 145-154. Pardo N, Avellan D R, Macias J L, Scolamacchia T, Rodriguez D, 2008. The ~1245 yr BP Asososca maar: new advances on recent volcanic stratigraphy of Managua (Nicaragua) and hazard implications. J. Volcanol. Geotherm. Res., 176: 493-512. Walker J A, 1984. Volcanic rocks from the Nejapa and Granada cinder cone alignments, Nicaragua, Central America. J Petr, 25: 299-342. There is no Deformation History data available for Nejapa-Miraflores. There is no Emissions History data available for Nejapa-Miraflores. 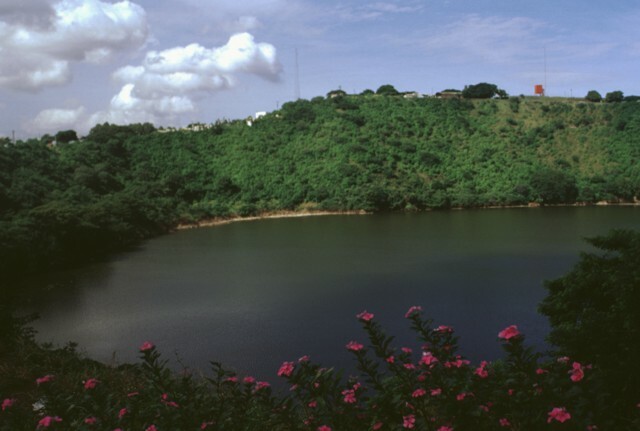 The steep-walled crater Laguna de Asososca provides water for the adjacent capital city of Managua. The elongated 1.3 x 1 km wide lake lies north of Laguna de Nejapa along the Nejapa-Miraflores lineament and is viewed here from the SE. In the background, beyond a bay of Lake Managua (the light-colored body of water at the upper right-center), is the Chiltepe Peninsula. This Laguna de Asososca is not to be confused with another crater lake of the same name at the southern end of the N-S-trending Las Pilas volcanic complex. Laguna de Tiscapa is seen here from the SW with a skyscraper of downtown Managua in the right background. The 700-m-wide maar overlooks the central part of the city. 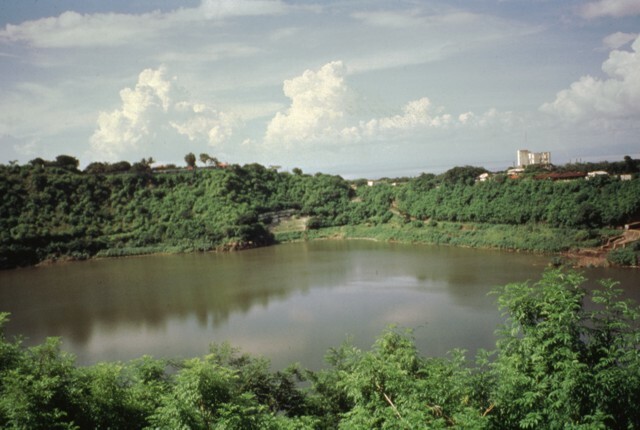 Laguna de Tiscapa lies about 5 km east of the Nejapa-Miraflores crater lineament along a major fault that cuts through the city of Managua. Laguna de Nejapa (right center) and Cerro Motastepe (left-center horizon) are part of the N-S-trending Nejapa-Miraflores alignment. 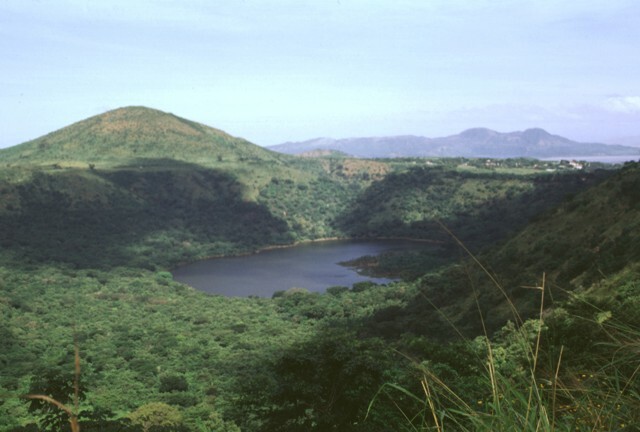 A series of pit craters and fissure vents extends into Lake Managua (barely visible at the far upper right) and is continuous with the volcanic vents on the Chiltepe Peninsula (far right horizon). The Nejapa-Miraflores alignment (also known as Nejapa-Ticoma) has been the site of about 40 eruptions during the past 30,000 years, the most recent of which (from Cerro Motastepe) occurred less than 2500 years ago. Laguna de Tiscapa partially fills a 700-m-wide maar on the outskirts of Managua, Nicaragua's capital city. 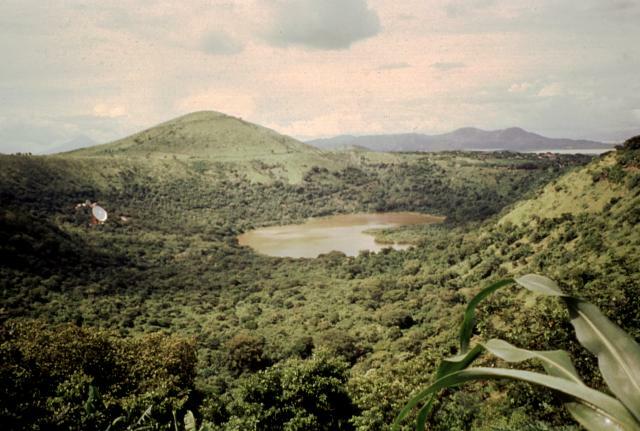 The maar was constructed along a major fault that cuts through Managua. 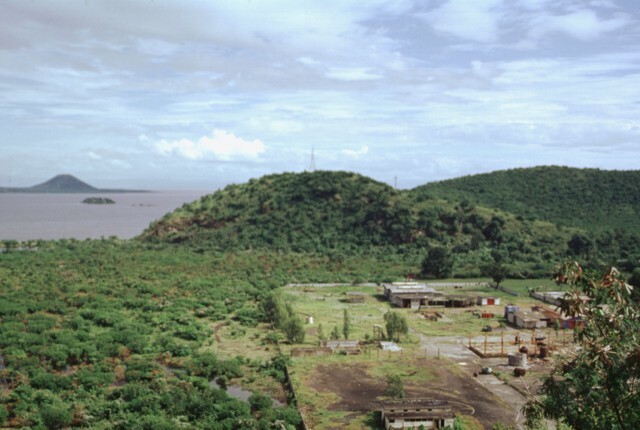 The rim of the crater overlooks the center of Managua and consequently has been the site of military fortifications dating back to the 18th century. The N-S-trending Nejapa-Miraflores alignment of cones cuts across the western outskirts of the city of Managua and extends across a bay of Lake Managua onto the Chiltepe Peninsula. Cerro San Carlos (center) lies along the southern side of the bay, while the conical peak of Volcán Chiltepe is visible at the upper left on the eastern tip of the Chiltepe Peninsula. Cerro Motastepe cinder cone (upper left) is the youngest and most prominent feature of the Nejapa-Miraflores volcanic alignment. The cone, seen here from the SE with Laguna de Nejapa in the center of the photo, is elongated in an E-W direction and rises 160 m above its base to 360 m elevation. Cerro Motastepe formed less than 2500 years ago. The surface of saline Laguna de Nejapa collapse pit (center) lies at about the same level as Lake Managua, barely visible in the distance at the upper right. A restaurant on the rim of Laguna de Tiscapa provides a scenic view of the a 700-m-wide maar on the outskirts of Managua, Nicaragua's capital city. The maar was constructed along a major fault that cuts through Managua. The crater overlooks the center of Managua and lies 5 km east of the N-S-trending Nejapa-Miraflores lineament, a 17-km-long chain of collapse pits and cinder-spatter cones that marks a point of right-lateral offset of the Nicaraguan volcanic chain. There are no samples for Nejapa-Miraflores in the Smithsonian's NMNH Department of Mineral Sciences Rock and Ore collection. Large Eruptions of Nejapa-Miraflores Information about large Quaternary eruptions (VEI >= 4) is cataloged in the Large Magnitude Explosive Volcanic Eruptions (LaMEVE) database of the Volcano Global Risk Identification and Analysis Project (VOGRIPA).